Charles Rowland Williams was born on 19 March 1909 in Hughenden, a small settlement in inland Queensland, some 250 miles west of the city of Townsville. He was the middle child of the three surviving children of sheep station manager Horace Williams and his wife Catherine. Australian country districts did not have elementary schools in those days so Williams was tutored at home without any other formal education until he went to Townsville Grammar School as a boarder at the age of 12. Leaving school at 16, he went home to work on the station his father managed. He also became a skilled mechanic and took up building wireless sets as a hobby. The great crash of the early 1930s led to his father losing his job, so the family bought their own farm which they had to work hard to build up. Like many young men of his generation, Williams had long wanted to fly and took some flying lessons at the aero club in Townsville. When war came, he was already 30 years old. Both he and his brother could have avoided military service on the grounds that their elderly father was ill, and could not run the property on his own but they both joined the army reserve. They agreed between them that Doug as the elder should remain in the army so that he could stay in Australia to take responsibility for the family, but younger brother Charlie should volunteer for the air force. In February 1941, some 17 months later, Williams began his training. He was posted to Sydney, and then on to a training school in rural New South Wales. At almost 32, he was deemed too old for pilot training and was mustered as a wireless operator/air gunner. On qualification, he was commissioned, one of the about ten per cent of each class who received this distinction. He was then posted to the other side of the world, England, which he reached by the method usual in those times – troopship to California, a six day train ride across the USA and Canada, and another sea voyage from Halifax, Nova Scotia. He arrived in Bournmouth, England, in November 1941, a few weeks before Pearl Harbor. This traumatic event had another, often overlooked, consequence besides bringing the USA into the war. The Australian government quickly realised how exposed their country was and many aircrew under training were kept back in case they were needed at home. It was a pretty forlorn gesture, however, as the RAAF had no potent strike aircraft. Their obsolete Wirraway trainers were no match for Japanese Zeroes in the battle of Rabaul in New Guinea in January 1942. Meanwhile, in England, Williams was caught in a training bottleneck, and it took several more months of waiting and training before he would be posted to an operational squadron. During this time his war experience began very suddenly, when his training unit was required to send several Hampdens on the first Thousand Bomber Raid, on Cologne on 30 May 1942. He was also sent on the later raids on Essen and Bremen. By September, he was ready for operations and had arrived at 61 Squadron at Syerston, as wireless operator in a Lancaster crew skippered by Flg Off Brian Frow, an experienced pilot, who went on to survive the war and rise to the rank of Air Commodore. Their first operation was a raid on Munich and they flew on seven more before Frow finished his tour. By December he was in a crew led by a New Zealander, Flt Sgt Ian Woodward, another pilot who lived through the war. Philip Burgess joined this crew as navigator in January 1943. By March 1943, most of the crew had completed their tour, but Williams had only done 28 trips as he had missed a few operations back in January through illness. He was keen to finish his tour, but he also wanted to get back to Australia, which would probably mean he would need to do a second. If he went on the normal six month inter-tour break that would only delay things. He also had broken off his engagement with a nurse back in Australia, as he had become involved with another woman in Nottingham, and he was keen to bring her back home so that they could get married. Yesterday I made a decision which may or may not be wise, I am joining a crew with an Australian as pilot, he, like myself has nearly finished his first tour and when we have finished we are going to another squadron and will carry on with our second tour without any rest, the second tour now consists of 20 trips and we believe when we have finished our operations we will have a much better chance of being sent home, and with the summer coming we should finish in three or four months, and I think it is better to do that than have to come back on operations after having been off for six months. The Australian pilot and the new squadron he mentioned were of course Norman Barlow and 617 Squadron. And so it was that his fate was sealed, for a few weeks later they were leading the second wave of the Dams Raid over Haldern in Germany when they hit the fateful electricity pylon. His casualty file in the National Archives of Australia has many insights into what happened after his death. 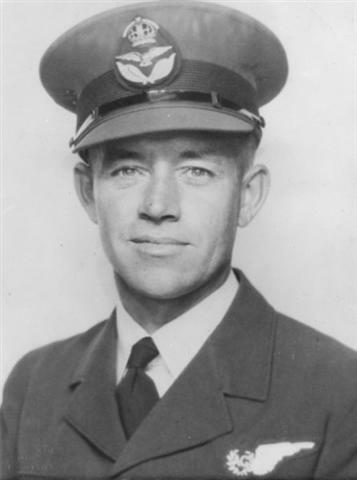 Like several other Dams Raid participants Williams had been recommended for a decoration, in his case the DFC, but it was not awarded until after his death. It was eventually presented to his mother. The news that he had broken off his first engagement had not reached Australia by the time of the Dams Raid, so his first fiancée, Millie McGuinness, was contacted by the authorities. Eventually his new fiancée, Gwen Parfitt, was able to set the record straight. How I wish I could tell you everything I would like to, there is so much I could tell you but until the war is over I cannot tell anyone but I hope in the near future I will be able to tell you some of the amazing things I have seen and experienced. Contrary to his normal practice he posted this letter immediately, the last in the string which kept on arriving at home well after his death. His letters and his other papers are now in the Queensland State Library in Brisbane. They were used in the biography of him written by historian Eric Fry, who married his sister Sheila after the war. Published in 1993 with the title An Airman Far Away, this book is a fascinating account both of his life and of the way in which the war impacted on an ordinary Australian family. Charlie Williams and the rest of his comrades were first buried in Dusseldorf, before being reinterred after the war in Reichswald Forest War Cemetery. Thanks to Susan Paxton for help with this article. Charlie was born in Townsville, not in Hughendon. There seems to have been a maternity hospital there; I suspect it was quite normal for outback women to go to town when they were due, and the Williamses would have been extra careful with Charlie since they’d lost the boy born between him and his older brother Doug either at or shortly after birth. Also worth noting is that Charlie was apparently offered the position of Squadron Signals Officer with 61 Squadron during his inter-tour break; he apparently was seriously tempted, but elected to go to 617 instead. His father was terminally ill and he was desperate to get home (his father in fact died on May 24, 8 days after Charlie). I am minded to write to commend you for the excellent blog about Charles Williams. Although I am not related to him his story reminds me so much of my late father who was a farm boy like him and despite having left school at the age of 12 was able qualify as a fighter pilot to fight the Japanese in New Guinea in 1943/44. I often wonder how these boys did what they did. Quite apart from the actual flying, the theory of flight and navigation alone would have been far beyond the capabilities of this so called well educated lawyer. I do however have two comments, not a criticisms, concerning the Battle of Rabaul in 1942 and the need for the the retention and repatriation of Australian air crew to face the Japanese. Whilst it is true that the Wirraway trainers of 24 Squadron RAAF were no match for the Japanese Zeros, it also should be understood that at the time of the attack the squadron had only eight serviceable aircraft to put up against a force of some thirty Zero fighters and eighty bombers. An impossible task which ended in the inevitable defeat, with three Wirraways shot down and a further two crash landing. The point is that it was not just the inadequacy of the only available aircraft that was the issue but also the number of them and available pilots compared to those of the enemy. Your comment that in light of the lack of modern aircraft highlighted by the defeat at Rabaul, the retention of Australian aircrew to combat the Japanese threat ‘was a pretty forlorn gesture’ seems to disregard the ultimate decisive role of the RAAF in the defeat of the Japanese in New Guinea and preventing a ‘Battle of Australia’. Regrettably, a similar view was taken by Winston Churchill and the British High Command at the time. The need for newly trained and experienced aircrew in Australia was, however very real. The gesture of seeking the retention in Australia and the repatriation of Australian air crew from the UK may well have been forlorn with respect to Rabaul but not subsequently in relation to the war in the Pacific in this region. As well as making the Australian government more aware of the Japanese threat, the attack on Peal Harbour had one positive effect from Australia’s viewpoint in that the USA, in realising the strategic importance of Australia in the Pacific region, began to make the P-40 Kittyhawk available to the RAAF. I think history supports the view that if a squadron of serviceable ‘Kittys’ had been available at Rabaul the result could well have been different. The role of the RAAF and in particular 75 and 76 Squadrons in the defence of New Guinea were particularly decisive in the battles for Port Moresby and Milne Bay. It was at Milne Bay in fact where the Japanese army suffered its first defeat on land, which would not have happened but for the support of the RAAF Squadrons. If Milne Bay had fallen Port Morseby and Australia were next in line. 75 Squadron was lead by Squadron Leader Keith ‘Bluey’ Truscott who had flown with RAF Squadron 452 which was commanded by the Irish Ace Paddy Finnucane before being sent to New Guinea. Truscott’s biography by Ivan Southall is a great read if you can get your hands on a copy. Charles, please don’t take offence at what I have said here. I may be over sensitive, but its just that when I talk to people from the northern hemisphere and subjects such as this arise, I detect a general lack of understanding or appreciation of the role played by the RAAF in the Pacific. All the credit seems to go to the Americans. Not so of course in relation to the contribution of Australian aircrew in Britain and Europe. I look forward to reading your further blogs. By the way. Do you know of a WWII Tornado Association in the UK? I Have a client/fiend of many years in his 90s who was shot down on D-Day and became a POW. He has had a fall and is pretty down and I thought if we could put him in contact with a former Tornado squadron member or Association it might give him a lift. Unfortunately all of his Australian comrades have passed on and no Association exists. Just found this painful quote from Charlie’s last letter to Gwen online: “I will have a lot to tell you when I do see you darling and I can only hope it will be very soon because I have missed you an awful lot and it seems ages since I saw you last. This letter will have to be very short dear as I have work to do and am only able to let you know that I have not forgotten you…” He was killed four hours after he wrote this. Volker, you can’t imagine how much time I’ve spent trying to figure out which boy in that picture is Charlie! I think that’s him in the middle front, though. I am Helen Brown nee Williams. Charlie was my uncle. with a nice picture of C.R. Williams on page 2 of the newsletter. Charlie and his brother Doug in fact! After 19 years research of Lancaster W4270’s loss with 61 squadron and not knowing what the identity letter was, it was an entry in C.R William’s log book that provided the detail, T for Tommy. Even now he is still giving. We owe him even more for being so diligent in his record keeping on top of his service and sacrifice. Thank you sir.